One of the ten strategic initiatives was to create the next generation digital repository. Named scholar@uc, it successfully launched in BETA this fall with 14 early adopters. These 14 UC faculty members are submitting their materials into Scholar@UC and providing valuable feedback that we will use to fine tune the repository. Scholar@UC is an important scholarly portal for all stewards, and its goal is to capture, organize, make accessible, enable reuse and reformatting, and preserve an institution’s intellectual output, cultural and historic records, and research-significant library collections of unique materials. Scholar@UC is part of UC’s Research Hub and is supported in partnership by UC Libraries and IT@UC. Other implications of Scholar@UC are to include external links and integration with national projects like ARL’s SHARE, a higher education initiative whose goal is to make a comprehensive inventory of research and to make it widely discoverable, accessible and reusable. Dragon Dance at the Lunar New Year Party. Last spring, librarians Olga Hart and Rosemary Franklin applied for and received a Diversity Grant, courtesy of the Provost’s Office. This matching grant from UC Libraries funded a year’s worth of activities that provided support and services for international students, celebrated different cultures and their traditions and created opportunities for students and staff to explore common issues students face. 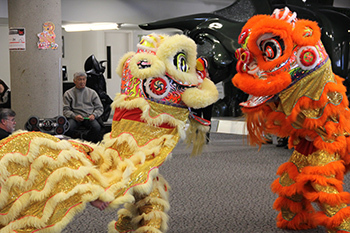 For its main event, a Lunar New Year celebration took place this spring on the 4th floor of Langsam Library. Dean Wang speaks at THATCamp. This year was an active one for the Digital Humanities and Digital Scholarship (DH/DS) strategic initiative led by Arlene Johnson, digital humanities strategist for UC Libraries. Speakers Lee Skallerup-Bessette, from the University of Kentucky, and Alex Gil, from Columbia University, both presented at the university to great success. This spring, UC Libraries hosted its first THATCamp, an unconference that attracted over 60 participants from both within and outside the university. This part of the campus-wide DH/DS awareness is building momentum. The “unconference” and collaborative style of THATCamp brought scholars and technologist together for many fresh ideas of integration, intersection and interdisciplinary opportunities among humanities, social science and digital technologies professionals. By hosting THATCamp, UC Libraries played an important role as connector, facilitator and catalyst in the stimulation of scholarly endeavors. 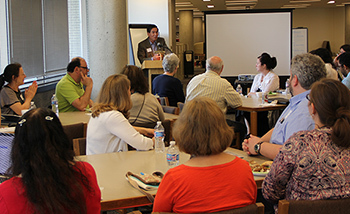 The Archives and Rare Books (ARB) Library continued its tradition of hosting these regular talks with speakers ranging from ARB’s own head librarian Kevin Grace to digital archivist/records manager Eira Tansey to former UC director of public relations Greg Hand. Topics included: Quoth the Raven: A Look at Edgar Allan Poe and His Most Famous Poem, Remembering as Resistance: Themes of Memory and Identity in The Giver, Cincinnati’s “Frail Sisterhood”: Nineteenth-Century Prostitutes of the Queen City. These 50-minute lectures provide an opportunity for students and staff to learn together and to engage with the speakers and with each other. UC libraries hosts some unique and valuable special collections, including Rare Books, University Archives, the Urban Studies Collection, Local Government Records and the German-Americana Collection. In today’s digital age, a program such as 50 Minutes Talks, which focuses on books and methods of research and extends to digital scholarship, is an excellent example of how UC Libraries can bridge tradition to modernity and the past to the future. This spring saw the successful return of the Life of the Mind lecture series with featured speaker Dr. Jeffrey Whitsett of UC’s College of Medicine and the Cincinnati Children’s Hospital Medical Center. This event provides a forum for interdisciplinary discussion and conversations with UC faculty. Life of the Mind is a partnership with the Faculty Senate and sponsored by the Office of the President. UC Libraries’ role as host provides an excellent example of our position as the ‘intellectual hub’ of UC’s campus. 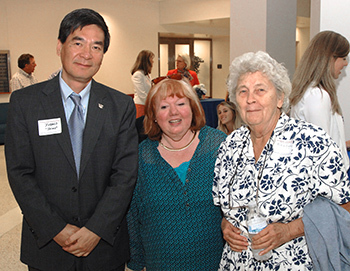 (left to right) Xuemao Wang, Doris Haag, retired director of the Winkler Center, and Eula Bingham, friend of the Winkler Center. Just last month, the Henry R. Winkler Center for the History of the Health Professions hosted the sixth annual Cecil Striker Society Lecture, with guest speaker Dr. Dale C. Smith. 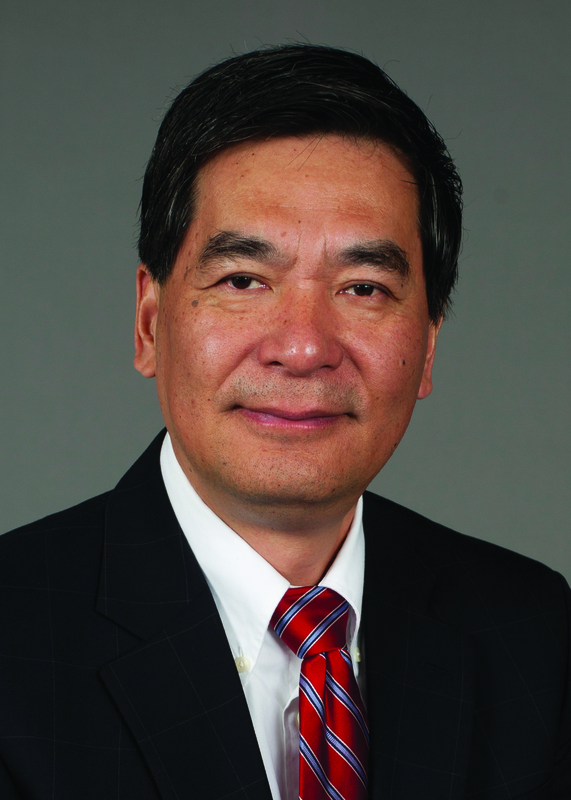 Titled, “The History of Public Hospitals: Cornerstone of American Healthcare,” this year’s lecture coincided with the UC Medical Center’s 100th anniversary. The display created for the lecture utilized some of the newly processed collection of Christian R. Holmes, head of the advisory board for the planning of UC Health and the person responsible for designing the hospital and its facilities. Also this year, the Winkler Center expanded their finding aid for the university hospital collection. The Cecil Striker Lecture is an important event to the Winkler Center and the Donald C. Harrison Health Sciences Library, as an opportunity to showcase their facilities and staff and to provide an opportunity for the UC Community to learn more about the history of healthcare. It is an opportunity for faculty, donors and members of the local medical community to come together, reinforcing UC Libraries’ goal to be a hub of discussion and knowledge for the university. While it is impossible to list in this review all that occurred in UC Libraries this past academic year and everyone’s contribution to our mission, I hope it conveys the exciting initiatives and collaborations underway by our staff and faculty as we strive to become the globally engaged, intellectual commons of the university.